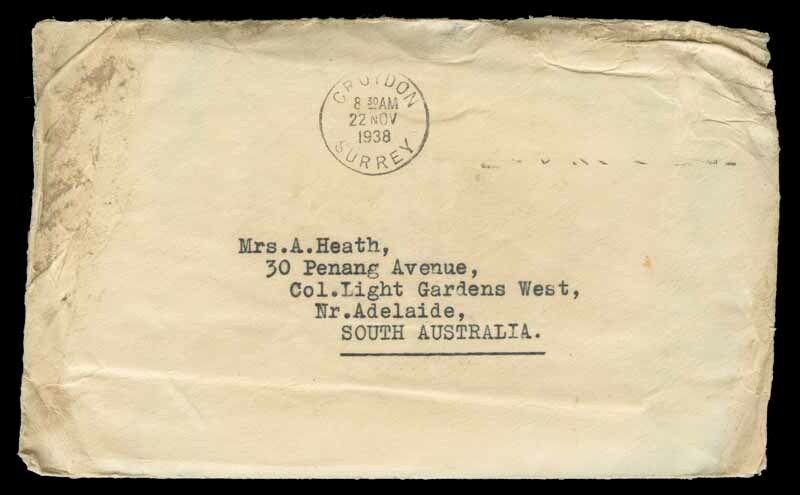 1931 Imperial Airways Second Experimental Air Mail intermediate registered Flight cover from Australia to Singapore, signed by pilot Hudson Fysh. 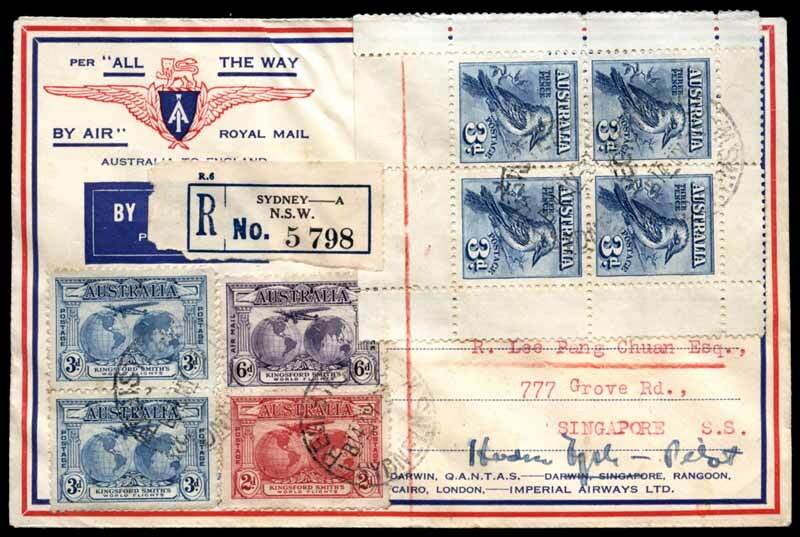 Stamped with 1928 3d Blue Kookaburra M/S (red registration line through selvedge) and 1931 2d, 3d (2) an 6d Kingsford Smith. AAMC 203a. 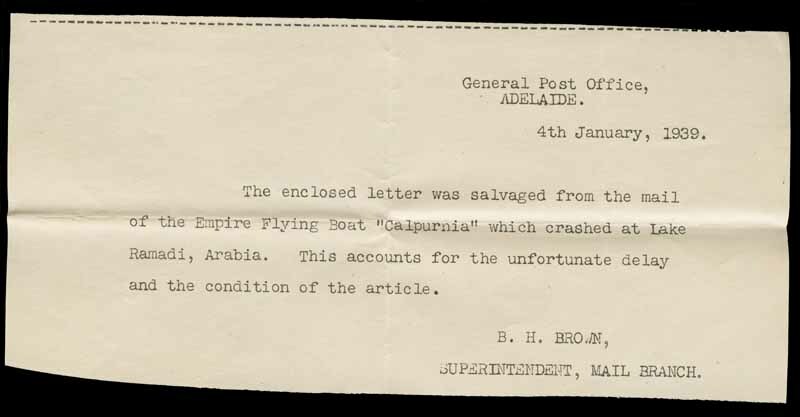 1938 Calpurnia crash cover, which occurred en route from England to Australia at Lake Habbaniyah, Iraq, together with duplicated letter from the Post Office apologising for delay and condition of the letter. Includes the original letter, in which the writer expresses concern about developments in Germany. Usual water damage. AAMC 834. 1975 Cover carried on the de Pinedo flight from Australia to Italy and 1976 Pacific Islands Flight cover carried from Melbourne to Melbourne, both on very attractive Jack Peake watercolour illustrated covers. AAMC 1,794 and 1800a. Selection of 64 First and commemorative Flight covers including 1929 Adelaide to Perth and Perth to Adelaide, 1934 Australia to New Zealand, 1974 Round Australia Flight (2),1975 Sydney to Paris (19), 1975 De Pinedo Jubilee Flight (9), 1976 Pacific Flight (12 various), 1981 50th Anniversary Australia to United Kingdom (6), 1967 Eldo F 6/1 Rocket cover (2) and more. Odd minor fault, but mostly fine. Catalogue Value $1,245.00. 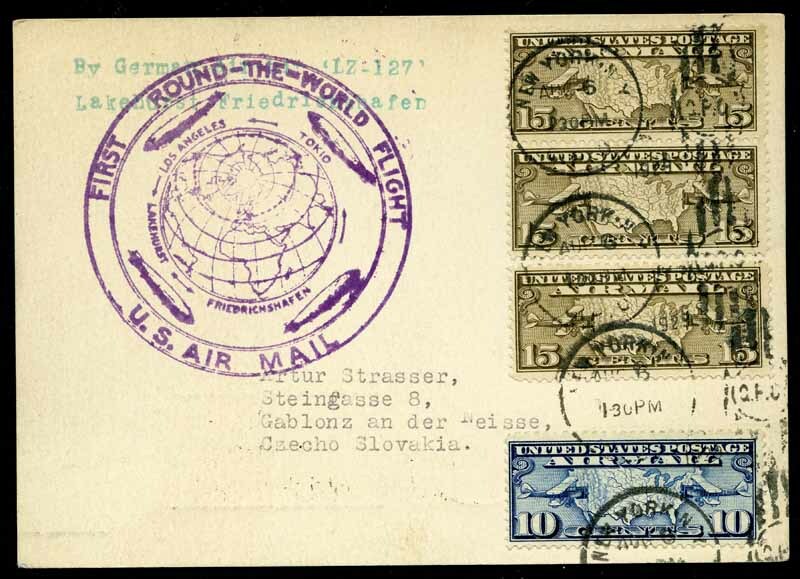 1929 First Round the World Zeppelin Flight card from Lakehurst to Friedrichshafen with official dispatch cachet, addressed to Czechoslovakia. Fine condition.